Fancy visiting the world's best hotels? It's a tough job but someone has to do it. The successful applicant will be invited on a one million-dollar (£600,000) year-long trip to review all the world's most exclusive resorts and hotels. These include Sir Richard Branson's Necker Island, David Furnish's new Champagne lounge in Las Vegas, the Velaa Private Island hotel in the Maldives and Europe's most celebrity-laden ski resorts. Travel firm Luxury Travel Intelligence and the VeryFirstTo website have posted the dream vacancy. They will also pay all expenses, which will likely include worldwide travel insurance. So what would it cost you to visit these opulent destinations under your own aegis? A week on Velaa Private Island would set you back £126,000. But for this you could enjoy a Michelin-starred chef, dolphin watching and a honeymoon suite exclusively accessible by boat. 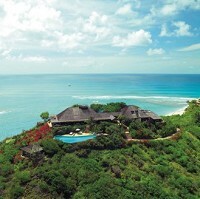 A stay on Necker Island would set you back £37,500 per room a night, meanwhile. Successful applicants even have the option of bringing a companion along with them, while modes of travel will be equally lavish, including jets and yachts. The reviewer will also sample the delights of Japan's Kyushi Seven Stars train. This is a high-tech luxury sleeper train that boasts just 14 exclusive suites in seven carriages. The most luxurious suites cost about £2,400 a night. But what is Luxury Travel Intelligence, a members-only resource for affluent globetrotters, looking for? Discretion, discernment, eloquence and sociability all figure heavily. The winning candidate will also have to show a significant passion for travel besides knowledge and experience, and have a fine appreciation of food, culture and entertainment. Michael Crompton, LTI Founder, told MailOnline Travel: "We have a duty to our members to check the reality behind the hype. This unique role will ensure that we provide our members with a seasoned travellers' input." Marcel Knobil, founder of VeryFirstTo, called the job "a mouth-watering banquet for anyone with an appetite for fine travel". Applicants can try their luck by registering on the website VeryFirstTo.com/job. They will be invited to attach their CV and explain in no more than 65 words why they deserve the opportunity.